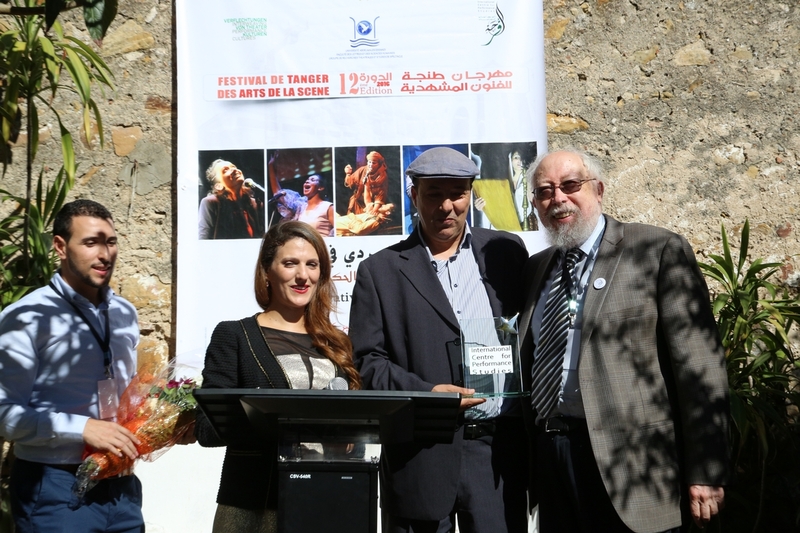 The 12th annual international conference organized in Tangier by the International Centre for Performance Studies (ICPS) and its partners was held this year September 15 through 19. This year’s theme was “The Narrative Turn in Contemporary Theatre,” a theme which not only recalled the growing interest in the Western theatre in narrative since the anti-illusionistic innovations of Brecht and Piscator, but also the interest in narrative which goes back to the earliest performance traditions in the Arab world and which has gain new attention in Western theatre in the work of Brook, Mnouchkine and many others. More than fifty international scholars presented contributions to this topic and their presentations were significantly supplemented by a variety of performances held in different venues in Tangier each evening of the conference. Heading the program were three keynote speeches. The first was by Gabrielle Brandstetter, co-director of the International Research Center “Interweaving Performance Cultures” in Berlin, one of the co-organizers of the conference. Dr. Brandstetter is one of the world’s leading authorities on contemporary dance, and her paper, “Dance and the Break of Narrative” utilized her expertise in that area of research to provide an important and original perspective on the general theme of the conference. The second keynote was delivered by Dr. Nikolaus Müller-Schöll from the Goethe-University in Frankfurt/Main, who spoke on Post-Traumatic Theatre and considered the challenges to traditional narrative performances posed by this sort of catastrophic experience. His central examples, Laurent Chétouane’s staging of Kleist’s Earthquake in Chile and Rabih Mroué’s Riding on a Cloud, provided powerful current examples of this dynamic. The third keynote address was given by Dr. Stephen Barber, from Kingston University, currently a fellow at the Interweaving Performance Cultures Centre in Berlin. He spoken on a topic closely related to that of the previous keynote, in this case, the narration of corporeal disintegration in the final works of three French artists, Patrice Chéreau, Antonin Artaud and Pierre Guyotat. A substantial number of the papers concerned Arab theatre topics and although the majority of these were presented by scholars from Morocco, where the conference was held, the geographical range of presenters and subjects was impressive. Among the presenters in English, Anastasia Remoudou from Qatar University spoke on two recent Arab stage adaptations (one Jordanian, one Lebanese) and one film using Greek themes to discuss the plight of Syrian women refugees. Fran Lloyd from Kingston University in London spoke on the performance video work of Emirate artist Karima Al Shomely, who has developed a series of works based on the history and forms of the Emirati burqa. Eman Mohammed Said Tunsi from King Abdul Aziz University in Jeddah spoken on two female stage narrative by Moroccan playwright Abdul Rahman Ben Zeydan. Katherine Hennessey from Queen Mary University of London and the University of Warwick, who is one of the leading researchers on the Yemeni theatre, presented a paper on the construction of narrative in the contemporary theatre of that country. Keziah Berelson, recently graduated from the University of Edinburgh spoke on the Palestinian one-woman play, The Alley, created by Samia al-Bakri, as an example of current female story-telling technique. Lyachi El Habbouch, an independent researcher, provided a welcome look outside the modern era to consider North African professional Women entertainers in American in the nineteenth and early twentieth centuries. Among the presenters in French, Zohra Makach from the University Ibn Zahr in Agadir, spoken on the leading Moroccan scenographer Abdelmajid Elhaouasse. Omar Fertat from the University Bordeaux-Montaigne, presented a paper on the recent work of the Lebanese artist Rabih Mroué. Lahsen Tielani from the University at Skikda, Alberia, discussed narrativity in the theatre of Abdelmalek Alloula while another Algerian scholar, Khamssa Allawi, discussed narrative in Algerian literature and the Algerian theatre in general. Said Karimi from Rachidia, Morocco discuss the work of two leading Moroccan dramatist, “Laabi” and “Benyoub” in their reaction to the repressive “Years of Lean” in that country. Bouchra Saidi, also from Rachiia, presented a reading of Abderrahman Ben Zidane’s drama “Silence Speaks.” Two papers were devoted exclusively to the leading Moroccan dramatist Tayeb Saddiki, by the scholars Azzedine Bounit and Laziz Mohammed. Another Morccan dramatist, Mohamed Timed, was discussed by Halima Al-Bukhari from the Educational Center of Kenitra and a general overview of narrating and performing in contemporary Moroccan theatre was offered by Mohamed Zohir, a scholar from Marrakech. Hassan Yousefi from Meknes presented an analysis of “Drunken Days” by Sa’adalah Wannous. Karma Mohamed Samy, chairman of the English Department of Ain Shams University in Cairo discussed intertextuality in a drama of Egyptian dramatists Faruk Khourchid. Finally, Sayf Al-Din Abel-Wadood Othman, a professor from Iraq, reported on techniques of narration in the Iraqi theatre. An important and praiseworthy section of the conference was devoted to the work of new and emerging scholars. Several of these were devoted to Arabic subjects. Rajae Khaloufi, a translator and high school teacher in Tangier discussed the work of translating Yossef Raihani’s play, Coming from the South. Zakaria Benamar, a Ph.D. candidate from Chouaib Doukkali University in Morocco, spoke on the poetic performances called Izran in the Moroccan Rif. Adeladim Hinda, a Ph.D. candidate at Ibn Tofail University spoke on the festive or ceremonial theatre concept of Abdelrkim Berrchid, and its manifestation in his work and that of Tayeb Saddiki. Raed bin Bashir Khadrawi, a student researcher from Tunisia, discussed the challenged and prospects of narration in the modern Arab theatre. Tariq Ribh, director of the house of culture in Beni-Mellal City, Morocco discussed narration in Moroccan street theatre. Scholars of Arabic theatre everywhere owe a considerable intellectual debt to this ongoing major exchange of information on Arab and world drama, to the various institutions in Morocco and Germany which support it, and especially to Prof. Dr. Khalid Amine, the guiding spirit whose imagination and boundless energy have made and continue to make it possible.